Banglarbhumi is an online web portal http://banglarbhumi.gov.in/ created by the Government of West Bengal. The web portal has been created for land & land reforms and Refugee & Refugee relief / rehabilitation. The website can be used to retrieve various kind of information regarding the land which include: Owner, Plot Number, Land Area and Value of the property, and the current owner. The digitalization of the land records is a complicated process in India since there are lot of places where the land papers are not complete. The digital India Land records modernization program aimed to make all these records available online and till September 2017 86% of this process was achieved. These details helps any person who is looking to own any land in West Bengal or is planning to sell his land. The information is particularly relevant for the entrepreneurs and industrialists who are planning to buy some land for any purpose. Through the portal, they can see the surrounding area, the facilities available near the site and evaluate the overall worth of the land. The person can check the maps and land details of the place by only filling the basic information which is the name of the district and the block. Thus, one can use the site for various registrations / know the procedure for various processes like RoR, Registration of deed, online mutation application, fee payment online, retrieving plot information and plot map etc. This is the primary document which is required mainly for the sale of the land / property. The document has been made mandatory by many states for the sale of the property / land. This is the document which shows how the ownership has been bestowed to a particular person and shows the flow of transactions of the property from time to time. The right towards the land could include information related to ownership, long term lease hold, tenancy related etc. Certain other information that the RoR document might contain is the loans taken by the occupant with respect to the property, details on the rights of the owner or occupant of the land. Rights if any by any community/government on the land. After visiting the site for RoR Request, the user needs go to “Service Delivery” and click on the RoR Request under the Service Delivery tab. 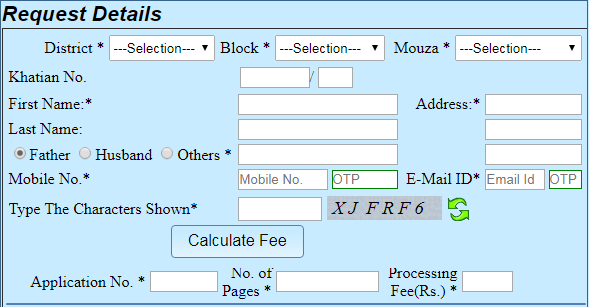 After filling all the details in the form shown above, one needs to click on the calculate fee tab to know the fee for the RoR copy. After knowing the fee, one can proceed to the payment section through online payment mode of GRIPS which could be debit/credit card or net banking whichever is convenient. In case after making the payment through GRIPS, there is no information then one needs to go to the service deliver tab and click on ‘Request GRN’. On this tab one can get a confirmation of the payment and also register the case in case required. If the applicant has paid through online mode ‘GRIPS’, then usually the user will get a receipt message immediately after the payment. In the other scenario, when the payment is made through ‘counter payment’ option of GRIPS then the user needs to go to the service delivery tab, request for GRN search and avail a signed copy for the payment. Also, in case of online mode of payment when the receipt is not generated, user needs to follow the same approach. i have the GRN number but i have lost the application number… please suggest what to do to get the application number… i have the e reciept where only the grn number is noted but no application number has been given…..
How long should it normally take, for the “Signed Copy” to be AVAILABLE? Signed copy downloaded but the new tap not open.